Cork is a natural and renewable product produced by the Cork Oak tree (Quercus Suber). Because of its unique properties: elasticity, lightweight, impermeability, insulation and resistance to vibration, cork has many uses. However, it is the production of stoppers for the wine and spirits trades that provides the main revenue that sustains cork forests in Portugal, Spain and other countries around the Mediterranean. 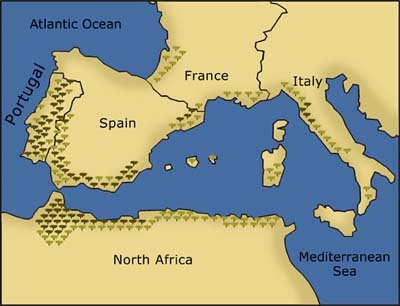 Cork oaks have been growing around the Mediterranean Sea for thousands of years. Today 60% of the world's cork comes from Portugal and 25% from Spain. The climate is particularly suitable for the cork tree and replanting of cork forests is encouraged by the European Union because of their environmental importance in preventing desertification in the Iberian Peninsular. Cork oaks are not harvested for their bark until they are about 25 years old. After this harvesting takes place every nine years (minimum legal period). The first harvest suitable for making into wine stoppers is not obtained until the third stripping i.e. when the tree is at least 40 years old. An average cork oak will live for 160 to 180 years and produce 15 strippings during its productive life. Perhaps because cork has been used for so many years, we forget the special properties that make this natural product superior to any other material as an effective closure for a bottle of wine. For example, every cubic centimetre of cork contains approximately 40 million cells each of which contains microscopic amounts of air composed of nitrogen and oxygen. This unique cellular structure allows a natural cork stopper to be compressed on the bottling line and then instantly revert to 85% of its original size to form an airtight seal with the wine bottle. No man-made material or other natural product has this capability. Another unique characteristic of cork is that when it is compressed, it does not expand in another direction. This is why a natural cork is easier to remove from a bottle and why it is less likely to leak than plastics in certain conditions. So, you may be wondering, why are there an increasing number of wines particularly in supermarkets, sealed with a plastic rather than a natural cork stopper? The reason is that in the last few years there has been an apparent increase in the incidence of wines with an unpleasant musty odour caused by the pungent chemical trichloroanisole (TCA) commonly referred to as 'cork taint'. Unfortunately, the term 'corked' is frequently used in English-speaking countries by the wine trade and wine connoisseurs as a general catch-all to describe a faulty wine, whatever the cause. - Decanter magazine, May 2001. Indeed, a recent study of faulty wines organised by the trade publication Harpers Wine & Spirit Weekly showed that less than a quarter of wine experts could tell the difference between wines which were tainted by microbial spoilage, acetic acid (both caused by poor practices in the winery), oxidation and TCA. In another study in 1999 the French consumer magazine 'Que Choisir' showed that many Bordeaux wines in the 1980's and early 1990's had been tainted with TCA while the wine was still in barrels. The cause in these cases was discovered to be a fungicide - pentachlorophenol, commonly used (until it was banned in 1994) for treating wood. In the humidity of the cellars the fungicide in new wooden panels and beams had transformed into unpleasant volatile compounds like TCA which were polluting the entire atmosphere. The report points out that until 1994 the same fungicide was routinely used on wooden pallets. In 1996, a six year study partly funded by the European Union into the causes of taint in wine, spirits and other drinks reported its results. Whilst TCA is rarely found in the cork forests, the Quercus report concluded it is the major cause of mouldy/musty taint. This chemical is found in many environments and has been known to contaminate a wide variety of food and drinks as well as materials like plastics, glass, metal containers and cork. To reduce the risk of TCA in the cork industry, the report made a number of recommendations that should be universally applied during the processing and production of cork stoppers. As a result a Code of Good Manufacturing Practice has been drawn up and the majority of cork manufacturers have volunteered to be audited by an independent body - Bureau Veritas - to prove they comply with this Code. Far from resting on their laurels, the leading cork manufacturers are also investing heavily into joint research programmes with Universities in Australia, France, Germany, Ireland, Spain, Portugal and the UK to find a process for making cork stoppers with a taint-free guarantee. In the last 12 months alone over $100 million has been invested in new plant and equipment using microwaves, ozone, vacuum extraction systems and autoclaves all to guarantee that when the corks leave the manufacturers (in vacuum sealed packaging), there is no possibility that they are contaminated with TCA or any other substance that could taint the wine. What does all this mean for wine consumers? Well hopefully, the incidences of musty wine caused by cork will decrease dramatically. Provided wineries from now on only buy their corks from manufacturers who have been audited, we the consumers should be content. Let's drink to that. The Cork Industry Federation is an association of companies involved in the importation, manufacture and distribution of cork products in the UK and for export throughout the world. To visit our educational website for schools and anyone else interested in learning more, click the button below. "Some weasel took the cork out of my lunch..."
W. C. Fields, Comedian and Actor. "I think I owe my life to cork soles."